Do You Care if The Best Laptop Ever Is the Most Impossible to Repair? At this point, we've gushed and slobbered about the Retina MacBook Pro enough (until we review it, that is). Today we learned that in addition to being an engineering marvel, it's a DIY black hole. Does that matter? The Retina Pro's unified construction not only means damage to the screen requires replacing an entire half of the computer, it means you'd have to risk destroying the entire thing to make changes. The RAM? Soldered to the motherboard. The hard drives? Proprietary and impossible to change. 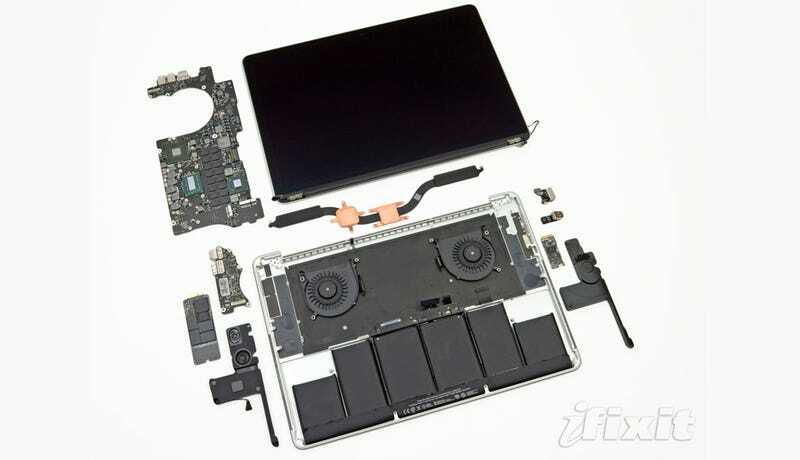 With upgrading memory and hard drive space the two most common jobs you can do on a laptop, does the fact that these are now impossible make the Retina Pro less attractive to you? Would fabulous performance and the greatest screen in computing history compensate for Apple blocking you from upgrading your rig and requiring professional repairs to it? Or does it just look like an aluminum venus fly trap? Is an impregnable Retina MacBook Pro something you'd buy?